Any advice would be valuable to me. The Nakshatra Moola is extremely important - bringing about serious challenges and transformations in life. In case you do not know much about that Nakshtra: try to get some information in the Net - which shouldn't be very difficult. Your Lagna (=Ac) is there and, equally important, your Moon. On the whole you'll be able to cope with those challenges as Lagnesh (=AC-ruler) is in the house of a friend (Sun) and aspects house 1 including Moon and Rahu. In 2015 (Sept.) your Sun- Mahadasa started. Sun conj. MA in house eleven, Sun ruling house nine. I can imagine your father has had a strong influence on you - mostly positive, supporting your goals? Anyway, house 11 means aspiration, the attempt to achieve goals, ambition. House 11 is aspected by SAT - which is not bad, as SA aspects the house where it is elevated. Your Sun is in debilitation - and so is your VE in house 10. And unluckily VE is not a very helpful planet for a SAG-Lagna. It rules house six - so I can imagine so far you may have had some unpleasant experiences in your VE-Mahadasa which started in 1995 and ended in 2015. Well, at the age of 7, 8, 10.. you do not care much about jobs, but I can imagine it gave you some trouble in the last years of that Mahadasa. VE is still "in effect" as it rules house 11 where your Sun is - your present Mahadasa planet. However, VE is exalted in your Navamsa - which should sooner or later support your ambitions. MER, ruler of house 10 is in house 12 - which brings me to the question what sort of job you have - or what sort of job you would like to have...? 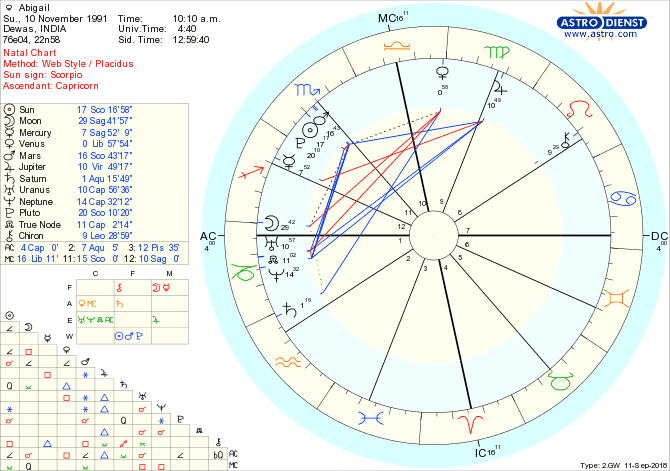 Thank you for replying and more importantly reading my chart. I graduated in law 2 years ago and finding an opening in my career has been challenging to say the least. I have faced constant obstructions and delays; basically, stuff that I feel I have no control over. It keeps happening every time I apply. I feel discouraged, wallow for some time and then try again with the hope that something will work out. But it never really does despite trying hard. I don't know what the problem is. I've tried taking help from friends and family connections tried looking for higher education programs, sat for countless government exams out of parental pressure but all in vain. None of them have worked out. How do my marriage prospects look like? Any insight on those? Also, it is nice to know that we share the same birthday. I've read a bit about moola-2. I want to learn more about astrology. Hopefully, I will. Well, you've got Ketu in your seventh house. And, the first thing that you'll hear about Ketu in 7 will be: diappointment, troubles im marriage. If marriage then only late. Etc. Well, I feel reluctant here to gon on like this here - one should be careful, not really knowing the other one, the person addressed. However, one has to face the fact that Ketu is a malefic that will definitely give rise to problems and challenges. The next time it will make itself felt will be the time of spring -summer- early autumn 2020. You'll surely know more about Ketu in house 7 by then. But do not be discouraged. In the video inserted above you'll find more than the "standard view" - there's a good and renowned astrologer speaking. Thank you for reading my chart and suggesting me the video. I guess its good to be mentally prepared for all the problems to come. The basic chart is good because Jupiter the Sidereal 1st lord is in 9th and aspects its own sign the ascendant. The Moon also gets aspected by Jupiter so in the end all deficiencies will be covered. Why are you stuck then ? It is situational- Saturn by transit moved into sidereal Scorpio in Dec 2014 leading to the seven and a half years of Sade sati of shani( Saturn's seven and a half year cycle relative to the natal moon.). It is annoying and frustrates, delays but not denies and delivers when you get fed up or give up. Since 2015 you have Sun major period- Sunis the Bhagyesha- Lord of the 9th in 11th- so it should have been good but unfortunately, it is in neecha(Fall) in sidereal libra. It doesn't get its cancellation of debility because its disposition venus is in fall too in 10th. The good thing is that Venus and Saturn have secondary dignity of being strong in D9( Navamsha)- venus in own sign libra navamsha and Saturn in exaltation in Libra navamsha. So, there is a back up. Mercury sub-period in Sun major starts from July 2019- that can bring you marriage and job as mercury rules 7th and 10th but it will come with a movement to another place or a foreign country as Mercury is in 12th house and 2nd from Sun. Most traditional astrologers would suggest Gaytari mantra for mental peace and also try the Shani Gayatri. Thank you for reading my chart. So grateful for your time and effort. I will recite the gayatri mantra and shani gayatri mantra daily for mental peace as per your advise. Does having "Venus and Saturn have secondary dignity of being strong in D9( Navamsha)- venus in own sign libra navamsha and Saturn in exaltation in Libra navamsha." means the back up will kick in after marriage? Meaning will my career take off after marriage? Sorry, I meant Venus is exalted in Navamsha hence secondary strength , whereas Saturn is strong in rashi in own sign. hence both issues of money, marriage and profession have strength. Saturn sub period is current and Mercury will follow which is vargottama (.e has same sign in rashi as well as navamsha) hence, even though mercury is in 12th , I chose the better of the two results for it. The mercury links the 7th and 10th houses- it is possible. So the placement of Rahu in 1st house and Ketu in the 7th house won't be a problem then? I've heard horrid things about this placement. Because of the Gaja Kesari yoga(Jup-Moon) all the defects will be overcome. Somewhere are read that Rahu and Ketu are- vijatiya i.e of other caste. I am a brahmin (hindu). So the caste of the spouse will be different?Thank you for your prompt and positive reply. Means a lot in this time. Can you tell me what all I could do to reduce or just the strength to endure sade sati? I fast saturday evenings and pray to Lord Bhairav. On tuesdays I go to hanuman temple. I recite Hanuman chalisa, hanuman vadvanal strota and surya mantra everyday along with the shani gayatri mantra you had suggested before. Is the gaja kesaru yoga formed in my navamsha chart? I just read in quora that it doesn't show effect if jupiter and moon are aspected by rahu and ketu. In my vedic chart jupiter aspects 1,3,5th house is aspected by Rahu. Moon aspects 7th house and aspected by jupiter and ketu. I am trying to learn a bit of astrology myself. To begin with, I try to see and understand all the implication of transits and the importance of house and lord in the chart. I started doing that after reading about sade sati. Also, saturn 2nd lord being in 2nd house, the interpretation made a lot of sense to me wrt to my childhood and all the problems I faced back then. That's why I am asking about this yoga. I want to learn and understand more. Maybe someday, I would be in a position to help people dealing with difficult times like me, the way you are right now.